Build relationships and build trust through instant and effective communication. 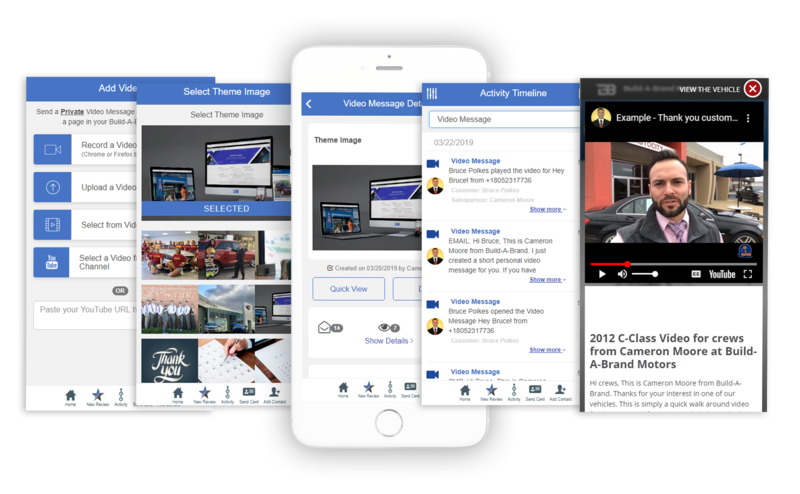 Build-a-Brand’s Video Messaging platform helps you stand out in your industry by staying in touch with your customers and prospects. Our one-of-a-kind system allows your messages to display on top of a page on your individual website so that traffic is automatically driven to you. Record your own personal video message, choose from your video library or upload videos from your device or YouTube. Personal video messages can play inside your website or on top of any external website. Easily direct customers to a vehicle, article, or webpage after they watch your video message. Get instant notifications when customers view your video messages. Know exactly when your customer opens an email or SMS. This allows you to make perfectly timed follow-ups in their channel of choice and stay in front of those customers who are seriously looking to make a purchase and close more deals. that I got, everything that I need and want and puts it altogether in one.